Dr. LaMar Hasbrouck is a self-described passionary whose approach to life has taken him from inner-city poverty to the highest levels of his profession. In G Street Lion, he shares his life storyhow a typical, fatherless black kid from urban America gains admission into the nations best public university, almost by chance. In this memoir, he narrates how he struggles during his first semester, cer… tain to flunk out, until he realizes that everything he needs to survive and thrive he learned growing up on G Street. Along the way, he discovers the secret for success, which takes him from the run-down dirt lots of the Pop Warner leagues in southeast San Diego to manicured lawns of some of the most storied football coliseums in the country. He goes from earning Ds and Fs in middle school to becoming a deans scholar in medical school. 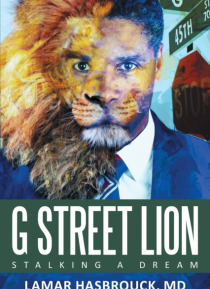 Told with honesty, humor, and occasional regret, G Street Lion recounts how Hasbroucks simple epiphany helped him to confront his worst fears, pursue his biggest dreams, and realize a future far brighter than he could have imagined.